"Zimbabwe. Eddie Masaya & Upcycling"
This Exhibition, focused on Zimbabwean artist, is an event that promises to expand the horizon and understanding of contemporary African Art. The exoticism of the fabricated preconceptions have changed. We are now the spectators of this emerging movement with an ever-growing body of art coming from so many African artist. Eddie Masaya, born in 1960, is a well known shona sculptor in his new phase as a painter. He was still at school when he decided to become a sculptor following the steps of his acclaimed cousin Moses Masaya, one of the pioneer of the first generation. With him he learnt how to use the tools correctly, how to polish a piece and specially how to respect the stone. Brighton Sango and Tafuma Gutsa have been another important reference in his work. In 2012 the canvas called him again…but it was in 2016 when this exhibition was born due to my obsession and his motivation. Eddie is a very spiritual person with a creative mind and has his own African aesthetical values. He is not a prisoner of anything, that’s why we thought it would be crucial for him to spent time in our workshop in Mombasa, Kenya. There he could explore a different environment, different fauna and a different African culture, subjects that are his source of inspiration. 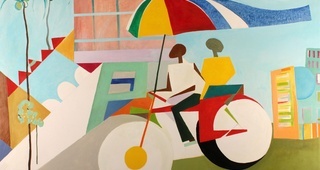 Masaya is an extremely “avant garde” artist and his eclectics paintings are the reflection of actual Africa. Johnson Zuze, Ngoni Tsiga and Trymore Sengai, are three contemporary young artists working with pre-existing material in purpose to transform them into a creative interpretation. We are showing this exhibition thinking that it was the right time to be more than ever concerned about our environment. Its a question of responsibility, people have to decide what they buy and how they dispose of it. Through art we created an impact that can help to reconvert the junk with the aim to preserve the health and the sustainability of our planet. We hope you to enjoy this exhibition as much as us.